Tender flesh of the squid – a true delicacy, and in combination with taste of sour cream is a real delight for the gourmets How to cook squid in a cream sauce, it was tender and melted in your mouth? Parsley and dill – to taste. Finely chop the herbs, pour in a bowl and set aside. Greens best cut immediately because squid is prepared quickly, and the time will not. If you overdo the squid in boiling water or on the stove in a frying pan, the flesh of the clam will become rubbery, hard and not so tasty. Squid defrosts. Better – natural way at room temperature. You can put the squid in cold water, the faster they will be unfrozen, but in no case do not put frozen carcasses into hot water. Thawed squid cleaned from the inside and immerse in salted boiling water (about 2 minutes). As soon as the thin skin will curdle, and the flesh will become white immediately comes out. Cool under running cold water or just allow to cool at room temperature. Clean knife to peel and cut into thin strips or rings. Heat the pan, put the butter and pour the sliced squid into the boiling oil. Constantly turn over, stir to not burn. Cook for about 2 minutes, then sprinkle with flour and fry for another 20 seconds. Add sour cream, stir, add boiling water (not a lot, but so that it almost covered the squid). Simmer on low heat for 1 minute under a lid, salt, pepper, sprinkle with finely chopped greens of dill and parsley, cover and turn off the gas. Squid ready. Before serving dish, sprinkle with finely chopped greens, grated on a fine grater cheese. It will give the dish extra tenderness and flavor. This dish goes well with potatoes (mashed or fries), with lentils, beans, buckwheat. A beautiful garnish can be veggies (vegetable stew or salad), seaweed, mushrooms. 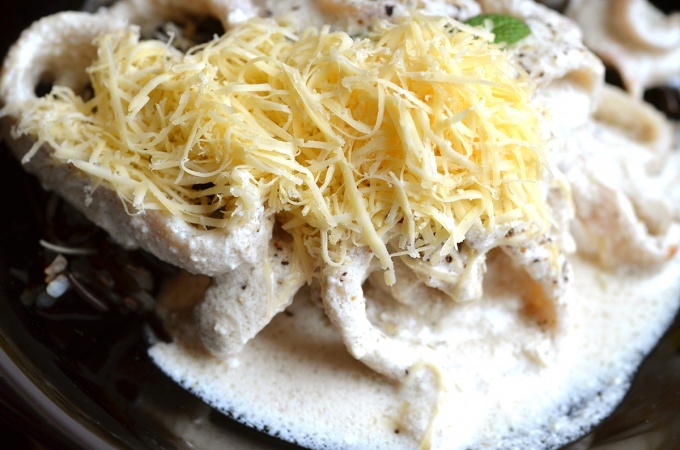 Squid in cream sauce is wonderful and without the side dish, and both hot and cold. Squid should not be in water more than 2 minutes, as their meat becomes tough and not tasty. It has again become soft, it should be cooked about an hour and a half. However, this cooking squid loses its taste and nutritional properties, besides reduced in volume by almost half.